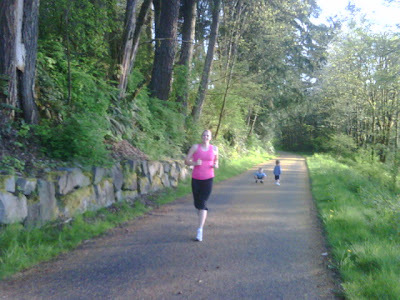 Tall Mom on the RUN: Home Course Advantage? Yesterday I was BLAH in the middle of the day, not wanting to run, so Muscle Man said we could run after I got home. SCORE.. While waiting for the boys to use the Honey Buckets (they love them!! EWWW) I saw a sign for a 5K and 10K race starting from the Trail head where we do our family runs. Hmmmm... This got me to thinking.. When I played Basketball there was such a thing as "Home Court Advantage." The premise is when you play at home you have the fans, the hoops you are used to, referees on your side (maybe) and the comfort of your own court. Does this carry over to Running/Racing?? Is there Home Course Advantage? As we ran I thought about it.. Sometimes knowing what is ahead can play with your mind....knowing every turn and how LONG it takes to get there could prove to be a Mental DRAIN.. BUT... I know this path. I know where the turnaround for the 5K is. I know that it is slightly downhill on the way out and can be challenging on the way back. I know the sections that smell like cow, where the bugs like to gather, and the spot where water gathers and it can be slippery on an icey morning. I know the exact point that the pavement levels out with .5 to the Finish Line. I know the twists, turns and landmarks. Could be. I am pretty excited to find out. The race is on September 24th, I think Muscle Man and I will register. Have you ever Raced on your "Home Course"? 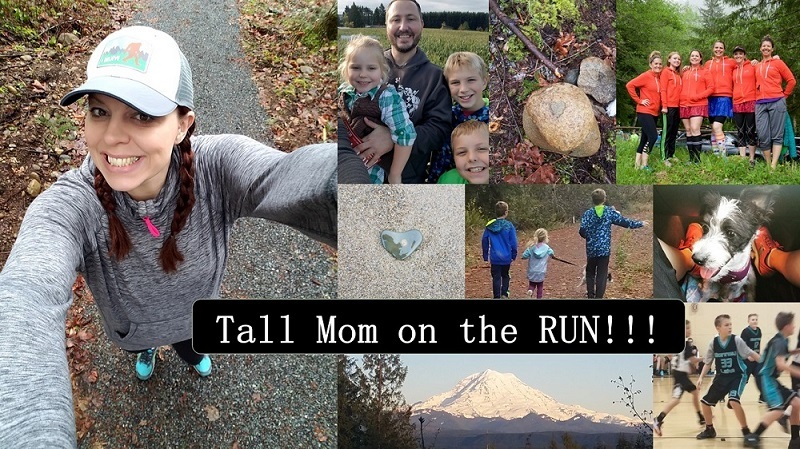 ****FYI I will be hosting a nuun Giveaway later today on my Tall Mom Facebook Page HERE.. So be sure to go "Like" my page so you don't miss out. I absolutely think there's a home course advantage with running. Yes, knowing how long it is can be hard, but wondering how long it is can be even harder. And all the advantages you listed are absolutely true. I think the only danger is if you let yourself be too comfortable while doing the race. Looking forward to hearing how it goes next month! i think there IS a home course advantage! Where i run is fairly hilly and when i've raced there, i've enjoyed passing people as we go UP the hills..because my legs are so used to the course! Definitely an advantage for you to know what's coming and how long it will take you to get there! I definitely think there is a home course advantage. My last half marathon was in my own hometown and it had lots of elevation changes (2500ish feet of change). I trained on the hardest parts of the course and come race day I felt way more prepared because I knew when it would get super steep and it would be ok for me to walk, or I knew that a downhill section was right ahead so I could push through the end of a climb. I am thinking there may be. That's why I'm considering running our town's half marathon. Most of it is on my usual running course and I have run it hundreds of times. I totally believe in a home course advantage for a million reasons, but most of all because when you travel to a race, it throws off your usual routine. Being able to wake up and take a short drive (or even just a short run!) to the start puts you at an instant advantage! There definitely is an advantage. Like you said, on my home court, I know every turn. I know where the next water fountain is, how much further I have to go. Sometimes you get tired of the same old trail but in the end, I will pick my home court every time when I need a boost! I think there is a bit of a home court advantage. I know the the course for the Issaquah Salmon Days race, so like you said I know ever turn, I also know where my weakness points are from past races so I can learn from my mistakes and push through. Definitely! I shaved about :15 a mile off my estimated time on a course I run almost weekly! (Green Lake - IronGirl 10k). I will definitely be taking advantage of my home court for the NYC marathon! The halfway point is at the edge of my neighborhood, miles 15-16 are the bridge I take into manhattan all the time, and the final 5 miles (toughest by far) are my normal "5th ave running route". Knowing I've done it before, landmarks, etc makes me so much more comfortable!!! TOO funny that the boys like the honey buckets!!! Future runners for sure. I have raced on my home course and I definitely think it's an advantage. Sure, it can mess with your mind if you're having a tough run - but at least you know you have pushed through a tough run in that very spot several times before! I also do better at races I have raced previously. Having re-ran races for years, I think the boost in confidence for knowing you can and have done the course helps but there have been times when knowing the course too well played with my mind. I kept feeling like I should already be a at a certain point and wasn't so I MUST be running too slowly. It's so much mental! I try to keep my thoughts on the "home course advantage" and benefit from the positives! I think having home course advantage could go either way. The marathon I ran this spring had a part of the course run along my usual running path. This was one of the hilliest portions of the whole marathon, so it definitely helped to know what to expect there. I don't think I'd want to be completely familiar with the whole course, though. I always like some sense of the unknown - keeps things exciting! Go for it girl!! I have run 2 half marathons and a 5k on my "home court". It helped me to know what to expect and I was able to train the course for the halfs. It just gave me comfort like an old pair of sweats! There is definitely a home course advantage: knowing the streets, the buildings, the turns...All of this makes a difference - especially in longer runs. I blew a marathon in Detroit about 20 years ago because I didn't know the course at all; I'll never make that mistake again. I definitely believe in home course advantage. Most of the time I've lived in NYC I've trained in Central Park, which is also where the majority of NYRR races are held. Of course, I can just about run each race with my eyes closed if I had to! I do think it helps to know what's ahead and be able to create a strong strategy. Yes, there is a home course advantage. When you go to a race that has a course that you are familiar with , there are advantages. The only downside of the familiar course is it's usually where you live, surrounded by people that you know, and people that know you run. So, there is a comfortable feeling , but at the same time there is pressure. I never feel more pressure than when I run the 5k in my town in November. I live and work in town, so I feel that I have something to prove. I love it and I fear it. I race on my home course all the time. And I love it. I know how to pace because I know what's coming plus the bonus is that my friends are always there. However I really enjoyed doing a marathon in another city when I got to really enjoy the new sites. It was easy to get lost in the "new city" and zone out for a bit... well until the mile 16-18 neverending hill came. Then I remembered where I was! What makes a Real Runner?